Complete Appliance Repair and Service is Salt Lake City’s leading full-service repair and service company. Family owned and operated, we genuinely care about the comfort of our neighbours, whatever Utah community they love in. Each of our technicians and representatives are local to Salt Lake City and contribute years of experience to our team. No matter the make, model or year of your appliance, whether it’s the latest technology or a “vintage charmer,” you deserve to get the optimal performance from your machine. Your refrigerator, dishwasher or stove is likely one of the costliest items in your kitchen. And your washer and dryer? It’s easy to take for granted just how key these items are in keeping you looking and feeling your best—as well as healthy. The proper removal of irritants and allergens (such as dust mites) is crucial to keep allergies at bay. Salt Lake County residents and business owners depend heavily on their appliances to make their lives easier. But what happens when a problem pops up? As a comprehensive on-site repair and installation company, we understand how important fully functioning appliances are. Even better, we guarantee a competitive price for sales, installation and repairs alike. Each of our team members is passionate about providing the best customer service to our Salt Lake City neighbours. If you’re in the market for a new appliance, it’s an exciting time. Not only do new appliances make your daily life a little simpler, they can also add great value (and looks) to your home. You deserve only the best, and at a competitive price, and this calls for a fun, no-pressure shopping experience. Repairing and installing appliances calls for experts who keep up to date on the latest safety standards and who have seen it all (and repaired it all). This niche industry is driven by a passion for electrical systems and a desire to see every customer satisfied. 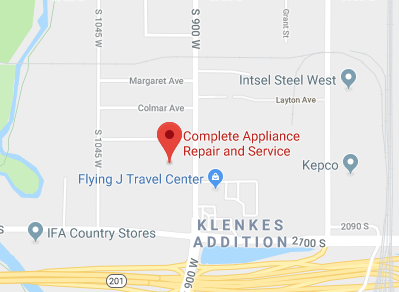 Whether you’re facing an appliance that’s giving out, finally ready to refurbish that perfect retro refrigerator to complete a renovation or you’re ready to replace an ailing appliance with the latest energy-saving model, let Complete Appliance Repair and Service be your go-to resource. We’re local, we know the ins and outs of every machine, and we won’t rest until you’re completely happy with the results.